Ladakh lies at altitudes ranging from about 9,000 feet at Kargil to 25,170 feet at Saser Kangri in the Karakoram. Thus summer temperatures rarely exceed about 27 degree in the shade, while in winter they may plummet to minus 20 degree even in Leh. Surprisingly though, the thin air makes the heat of the sun even more intense than at lower altitude, it is said that only in Ladakh can a man sitting in the sun with his feet in the shade suffer from sunstroke and frostbite at the same time. The original Choglamsar village is situated on the bank of Indus river. The new Tibetan refugee camp just off the main road from Leh, which is important center for Tibetan Culture, History and Buddhism. Tibetan children village has library, Medical center, Traditional Handicraft shop and study center. Around one Km from TCV towards Hemis the central Institute of Buddhist studies, the study center for Tibetan Buddhism and Ladakhi culture has Tibetan painting and sculpture school, library with good collection of books. Around 14 Kms from Leh, across the Choglamsar bridge. The Stok Palace was built by King Tsespal Tondup Namgyal in 1825. The present Royal family resides at Stok Palace. The Stok Palace Museum has vast collection of thankas, traditional clothing and ornaments from Royal family. The Gurphug monastery is 1 Km from the Palace and this is the branch of Spituk monastery. The festival called “Guru Tsechu” take place on the 9th and 10th days of the first month of Tibetan Lunar Calendar. Shey, 15 Km south of Leh, was constructed by the first king of Ladakh, Lhachen Palgyigon and of successive kings. Around 12 Ft. Shakyamuni Buddha’s statue made by copper guilt is the largest in the region, built by Deldan Namgyal in 1633 is a funerary memorial to his father, king Singee Namgyal. There is another statue of the Buddha three stories in height at dresthang down the castle. Stone carving and many chortens are scattered around the Dresthang Gompa. On the 30th day of the 1st Tibetan month celebrates shey rul-lo and on the 10th day of the 7th Tibetan month the festival of Shey Surb-lo is held. About 2 0Km south of Leh. This Gompa is situated on the top of the hill and part of Gelukpa order. the disciple of Jangon Tsongkhapa, Sherab Zangpo of stod, first built the temple of Stagmo Lakchung at the top of Stagmo Lakchung at the top of the Thiksey valley. Then Paldan Sherab nephew of Sherb Zangpo, founded Thiksey monastery. There are sacred shrines and a many precious objects to be seen. The successive reincarnation of the Skyabje Khampo Ringpoche act as incharge of the monastery. Thiksey gustor (festival) held from 17th to 19th day of the 12th month. There are chance to see prayer in the early morning. Around 46 Km from Leh, Takthok monastery was a meditation cave of mahasidhas “Kunga Phuntsog”. Later, it started calling Takthok (rock roof) monastery. The festival of Takthok held on the 28th and 29th days of the 9th month. Gompa is 26 Kms south of Leh on the opposite bank of Indus river, belongs to saskya order, founded about five hundred year ago by Lama Dunpa Dorjey. The festival called “ Matho Nagrang” takes place every year on the 14th and 15th days of the 1st Tibetan month. Rangdum is the first Buddhist monastery one encounters on the way from Kargil to Panikar and Parkutse. From Kargil one can reach it in a seven to eight hours drive by Jeep. The monastery stands on a hill in a mountain valley, which in that area is rather wide. Rangdum was founded by the Gelugpa as in the early 16th century at present, over 40 monks live there under their abbot Ngari Rinpoche. It takes one day drive from Kargi via Rangdum to reach the monastery and village of Sani, which lies about 10 Km before Padum. The Sani Monastery belongs to the southern branch of the Drukpa Kagyupa school. This sanctuary is, however for Buddhist of such high importance that even other sects worship it deeply. According to a legend, the chorten, standing in the oldest part of Sani monastery dates back to the 2nd century A.D. The Dukhang which forms the center of the later built monastery part, was erected in the early 17th century. A few meters to the north west of the monastery, outside the wall, lies one of the eight most important cremation grounds of Tibetan Buddhists. The village of Tonde can be reached from Padum in a four to five hours hiking tour through a bare, desert like plateau. The monastery Marpa Ling stands high above the village on the way to the Ronde Pass. The originally Red Hat Monastery was reformed in time and belongs now to the Gelugpa school. Over 50 monks of this sect are working in Tonde. After a five hours walk from Tonde, along the right bank of the river Zanskar one arrives at Zangla the main village of the small principality bearing the same name. The castle of Zangla towering on a mountain ridge above the village is almost entirely destroyed. The Raja of Zangla lives, nowadays in the village amongst the common people. 13 Kms is a splendid valley between Solang village and Beas Kund. Solang valley offers the view of the glaciers and snow capped mountains and Peaks. It has some fine ski slopes and the Mountaineering institute has installed a small ski lift for training purpose. Lahaul is marked by a central mass of almost uniformly high mountains and massive glaciers. The two rivers Chandra and Bhaga which rise on either side of the Baralacha La, flow through the Chandra and Bhaga narrow valleys. Lahaul is also a facinating areas for Buddhist art and culture. The monasteries of Lahaul are rich repositories of ancient murals, thankas, wood carving and golden images of Padmasambhava. The valley lies at a height 2745 meters above sea level. Summer in this valley is cool and pleasant with green grass and alpine flowers. Lahaul is very difficult and mountainous areas which remains cut off for 4-5 months from the rest of the world. Lahaul Spiti is enclosed by high mountain ranges from all sides which make the access a difficult and sometimes impossible. 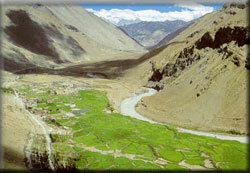 Spiti is the e sub division of Lahaul and Spiti district with its headquarter at Kaza. It is called “ little Tibet” because it has almost the same terrain, vegetation and climate. Spiti also means “ middle country”. It lies between Tibet, Ladakh, Kinnaur, Lahu\aul and Kulu. The sight of mountains in Spiti is unique. The Spiti river is flowing fast through deep georges at some places. The valley is not wide but there are villages and some fields where people grow barley, buck wheat, peas and vegetables. The oldest and spectacularly set Lamayuru monastery is about 125 kms. West of Leh, founded in the 10th century . in 11th century the Mahasiddha Naropa came to this place. Then Rinchen Zangpo translator came and built many temples and stupas and then teaching of the Kadampa school came to flourish. Later Jamyang Namgyal offered it to Chosje Danma and Digung Kargyut school were introduced and named Yungdrung Therpalling. The Yundrung Kabgyad festival is held on the 28th and 29th days of the 2nd Tibetan month. The Nubra valley lies in the north of leh and is accessible over the Khardungla pass 5600 Mtrs which is one of the highest motorable roads in the world. The Nubra valley has opened for Foreign Tourists in 1994 by the Govt. of India to expand tourists opportunities in ladakh region. The valley is on the trade route from leh to Khangar via Samsar and Karakoram passed. Apart from unparraled trekking opportunities. The valley have serval Buddhist Gompas Diskit Gompa is 350 years old and is situated on the highest point near the village in which there are about 120 Resident Buddhist Monks. The Tsomoriri Lake is situated at an altitude of 4525 Mtrs & distance of 240 Kms from Leh. The Lake is in the south east sector of Ladakh. It is like a pearl shape & having large minerals deposits. Korzok village is situated on the south west bank of this Lake. Korzok Gompa and its inhabitants the Nomads (Changpas) are most outstanding features of this Lake. Chumathang on the way to Korzok is famous for medical hot spring which is about 140 Kms from Leh. The Pangong Lake situated at an altitude of 4350 Mtrs, Pangong Lake lie in the north east of Leh. This famous blue brackish Lake of Pangong is 5/6 Kms wide and over 144 Kms long with half of it running the other side of the “INDO CHINA BORDER”. The mountains around the Lake are of various shape and colors. The Lake with its color, an exquisite scintillating shade of blue, the orange and carmine tints of the sunset turn it into a wondrous work of nature. The villages, shepherd lands and the landscape enroute to this large are very interesting. This place may be approached by across the Changla pass (5486 Mtrs). Zanskar, in the Kargil sub-division of Ladakh is situated between the Great Himalayan range in the south and Indus valley in the north. The river Zanskar which flows through it, joins Indus river a little below Leh. The whole valley is situated in the inner Himalayas and is higher than most other areas of Ladakh. The greatest attraction of Zanskar are its Buddhist culture, beautiful monasteries, awe-inspiring barren mountain shape and the twin peaks of NUN (7135 Mtrs.) and KUN (7077 Mtrs.). Padum is the headquarter of Zanskar and is joined by rough road to Kargil. The valley is about 300 Km long and is connected with Manali and Leh by passes over 5000 Mtrs. Trekking on these trails involve strenuous walking at altitudes between 300C and 5000 Mtrs. The people are mainly Buddhist and much like the people of Ladakh in their dress, customs and religion. Once capital of the Zanskar valley, lies on top of a hill at the far end of the Lungnak valley. The majority of its 400 – 500 inhabitants are Muslims who are engaged in trading. At the eastern border of Padum, a suspension bridge cross over the Tserap Lingti Chu. From there a path leads along its right bank, and further along the river Zanskar, towards Tonde and Zangla. To the southwest, slightly above Padum, lies the Monastery of Stagrimo, which can be reached in 15 minutes. The monastery of Stagrimo belongs to the Drukpa Kagyupa order and is presently the home of about 30 monks. The monastery of Karsha lies to the left of the river Doda. From the Tungri bridge, it takes four hours of trekking and three hours by the raft on the doda, to reach it. The monks quarters and temples of this biggest monastery of Zanskar can be seen crawling picturesquely up on a steep mountain slope. The monastery of Karsha belongs to the Gelugpa order and is looked after by Likir. Like in Like, the abbot is a brother of the Dalai Lama. The Chamba Ling temple, which one encounters on the way to the monastery, dates back to the 11th century whereas, the monastery itself was built in the 15th century. The monastery of Bardan can be reached from Padum by trekking four hours down stream. Built on a rock, it towers high above the Tserap Lingti Chu. The monastery belongs to the Drukpa Kagyupa order, the abbot is Stakna Rinpoche. The monastery was founded in the 16th century. Its most important room is the Dukhang, which lies on the ground floor. The shrine on the first floor is dedicated to Maitreya, the Buddha of future ages.